The launch will feature readings from featured and guest poets and writers from around NZ plus tracks from the very first in Catalyst's Spoken Word Series. Be the first in the world to hear the latest innovation from your ever-lovin' Neoismist Press and She'll Be Right Records. The CD was produced by Jody Lloyd of She'll Be Right Records and represents a collaboration between writers/speakers and original New Zealand music. It is a bold project that dares to feature music on an equal footing with the spoken word and sets a tough bar for future Spoken Word CDs to achieve. Featured are voices/accents from around the world now resident in Aotearoa and one or two pieces of music by New Zealanders now based overseas. This reflects the great kiwi tradition of immigration/emmigration - the transient nature of modern New Zealanders and the fluidity of citizenship and belonging to this place we call 'home'. Catalyst has always sought to highlight this multicultural reality as well as feature established artists alongside emerging or young talent. The Catalyst Spoken Word Series is true to this form with several recognisable names among a few 'first-timers'. All with unique voices, listen for yourself. 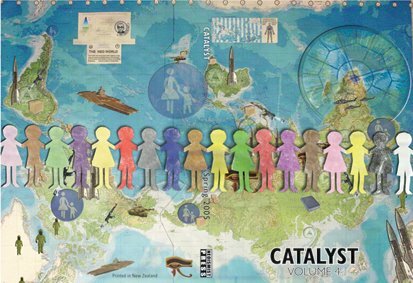 The CD of Catalyst Spoken Word Series comes with your copy of Catalyst volume 4. Copies and subscriptions will be available for sale on the night or email us using the sidebar link. Details regarding submissions are included in the book or alternatively please check out our profile in the sidebar. Submissions not following the guidelines may automatically be excluded from consideration. 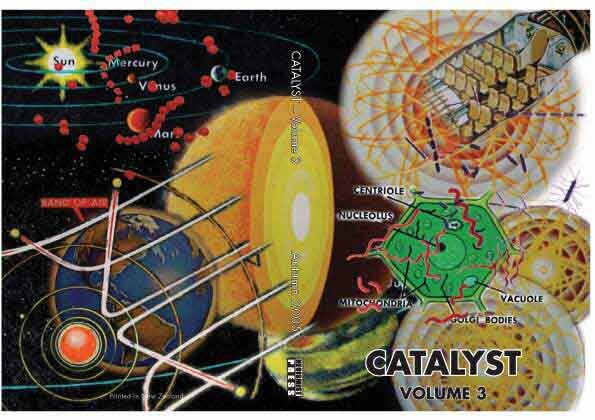 Please note: The launch party for Catalyst 4 has been pushed back to Thursday December 1. Bring your writing to share or come, listen, have a few drinks - you know the drill! 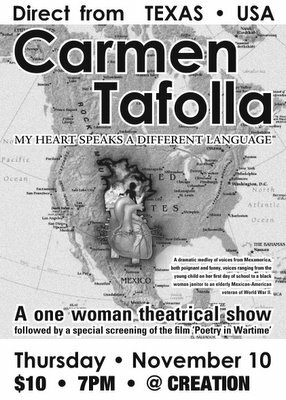 Direct from the Wellington International Poetry Festival - a one-off screening of powerful new documentary Poetry in Wartime will follow Carmen's performance. Don't miss your only opportunity to see the film that had everyone talking at the International Poetry Festival. Every year, the New Zealand Society of Authors (NZSA) commemorates writers around the world who have been suppressed, abused, imprisoned or executed. This year, Courage Day commemorates the 10th anniversary of the execution of Nigerian writer Ken Saro-wira, who was executed along with eight others for campaigning against the devastation of the Niger Delta by international oil companies. This Courage Day, the Canterbury Branch of NZSA will hold a readings event and get-together on Thursday 10th November at the Madras Cafe Bookshop at 165 Madras Street (opposite the CPIT). The event will commence at 5.30 pm for a 6 pm start and will feature Zimbabwean journalist and human rights activist, Shupayi Mpunga, as keynote speaker, and a series of readings, highlighting Ken Saro-Wira's life and other freedom of expression issues, by local writers. The NZSA is a non-profit organisation and there is no charge for this event. 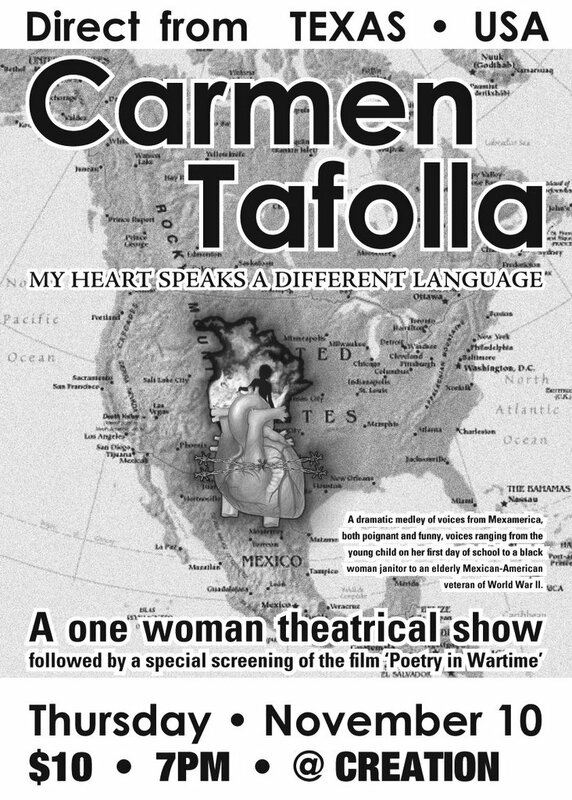 So go along, check it out and follow it up with My Heart Speaks a Different Language, the one-woman show by Mexican-American poet Carmen Tafolla at 7pm in Creation. See previous post all about this amazing event.